But when she is bad she is horrid! When I am in the zone on GAPS I feel amazing. I feel so much energy, so alive in my body and my thoughts and reflexes are so sharp. Everybody and everything is wonderful and it is easy to respond positively to the daily niggles. I totally forget about eczema and asthma and allergies – they don’t exist. When something snaps (a few nights in a row of bad sleep or a busy week) then my routine of cooking and eating is disturbed and I fall off the wagon. One of the hardest things I find about being on this diet is being prepared with food-to-go. There are often times when I am out and about in the car all day long, and if I don’t have a sufficient food for me to eat then I have no choice but to go and buy something. The are lots of great places to eat on the Gold Coast, but few options for grain- and sugar-free diets. So sometimes I have had a few slips, either by chance or by choice. When I am busy, tired, not prepared, perhaps a little stressed I think, “a sandwich won’t hurt”. The last sandwich I ate has hurt me now for about 2 weeks. Headache, extreme tiredness and joint pain was the immediate result, and I’ve had a lingering pain in my foot all this time. I am sure there is more involved with this pain, on a deeper level I have needed some rest (sleep!) and some nourishing from sources other than food (sunshine, quiet time, family, friends, meditation, creative play). A week of rest and a return to the GAPS introduction diet has put me back on the right track and the pain in my foot has diminished. It is a relief not to limp everywhere. Pain is a great reminder but it is exhausting having to live with it every day and I am extremely glad I don’t have to. So the result of all this is a renewed commitment to preparation. Back on the menu planning, making sure I have enough basic supplies to keep me going through the days. The key to it all is stocks and soups. Home made meat stock is not optional on the GAPS diet. It is essential and I always have several jars of it in the fridge. It goes into almost every meal I make for myself and my family. It also forms the basis of the soups that I eat for breakfast and lunch. I am supposed to drink it with every meal to help with digestion, but I haven’t developed that habit yet. The gag reflex from my vegetarian days kicks in when I try to drink neat stock. But put some veggies in and call it soup and I am ok with it. My thermomix (also known as Thermoslave) is set to work almost every morning making a new batch of soup and I love it when my fridge is full of rainbow coloured jars of goodness. Here is one of my favourites: Carrot and Ginger Soup, this time with beetroot to give a deep wintery flavour and colour. Roasted beetroot would be even more delicious, but I didn’t do that this time. Perfect comfort food and a great breakfast for a cold morning. I thoroughly recommend starting the day with a hot soup and a dollop of yogurt or sour cream. My body sings. 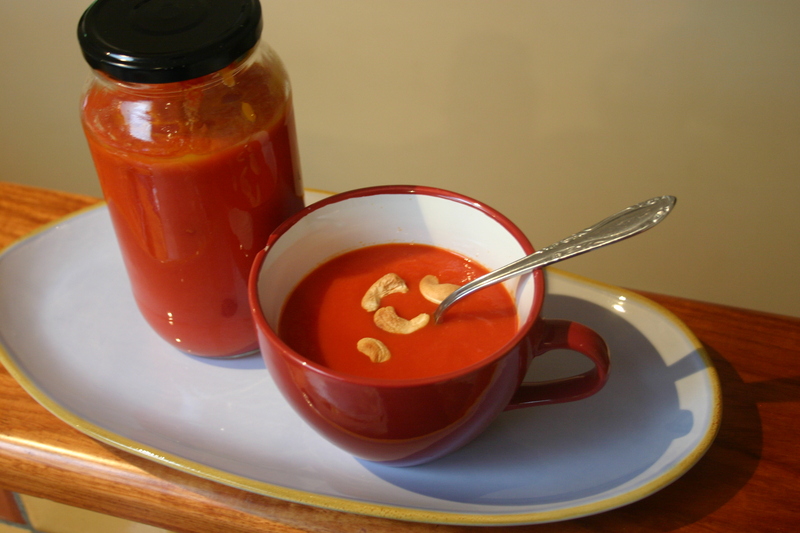 If you are vegetarian this soup can be made with vegetable stock, but please make it yourself – so much more nourishing than salty stock cubes! 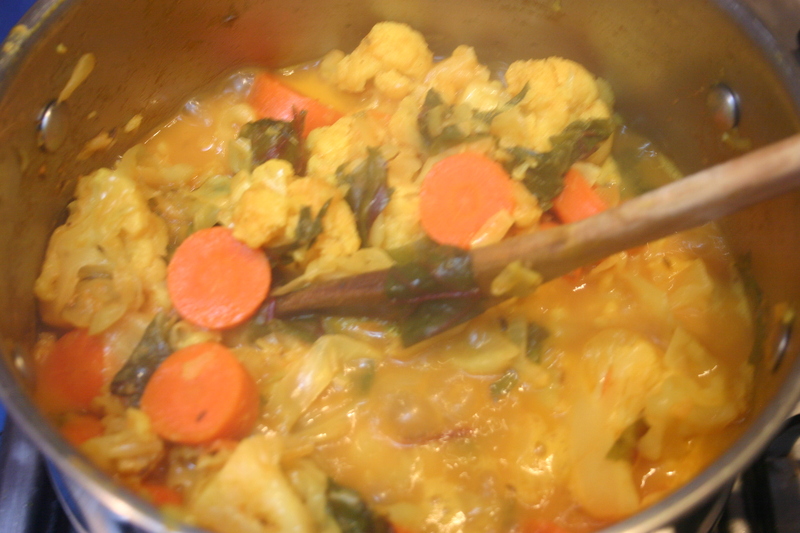 The soup was also used to thicken the curry that I made for dinner the other night. On GAPS my family and I have gotten used to watery sauces, as flour, arrowroot and cornflour can’t be used to thicken. So now I use soups, nuts ground into a paste, or mashed pumpkin to thicken up our meals if they require it. 1) Heat oil and cook ginger and garlic for 2 minutes or until fragrant. 2) Add salt and stir. 3) Add vegetables and stir on medium heat for 5 minutes or until edges are softened. 4) Cover with stock and bring to the boil. 6) Blend to preferred consistency and serve with sour cream. 1) Heat oil and when hot, add ginger, garlic, turmeric, salt and curry powder. Stir and cook until fragrant. 2) Add chopped carrot, cauliflower and cabbage. Stir together with spices until well coated. 3) Add stock and soup and cook until tender. 4) In last five minutes of cooking, add chopped spring onion and beetroot tops. 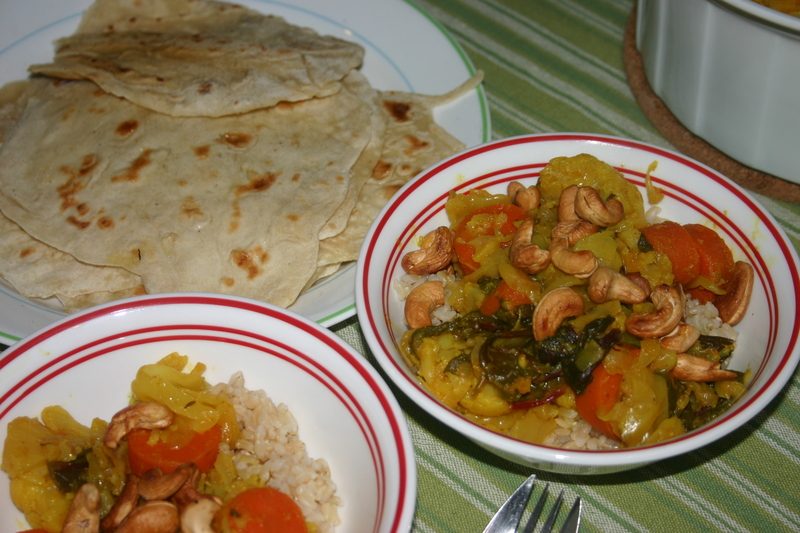 6) Serve with rice and chapatis (for the non-GAPS members of your family)and sprinkled with toasted cashews. Love your recipes – thanks. After 2 years of SCD then GAPS, when I am out and about I find that I can slip into a McDonalds and order a burger with no bun or sauces….as long as it is the 100% beef patty. 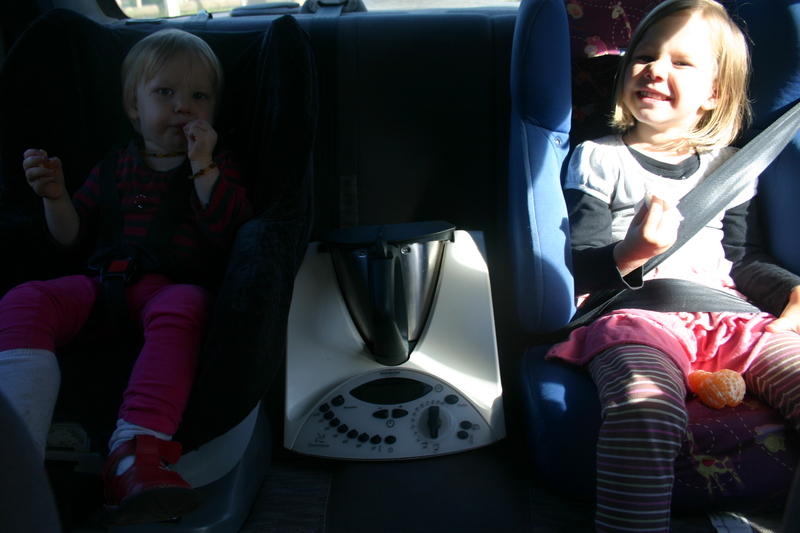 It’s not the ideal situation since they use seed oils to cook but better than consuming grains. And I don’t have any side effects. Also, you can choose a salad with the beef patty cut up on top. My husband has been inside the factory where they make the 100% beef patties and they are truly that. Enjoy!